The effect that light has upon landscape is the starting point for most of my work. The way that a shadow falls across a wall or the sunlight picking out a distant field can alter a scene that we think we know so well and yet in that fleeting moment a new possibility of reality is called into being. My preferred medium is watercolour. The wonderful transparency and immediacy of its nature seems to be the perfect medium to try to express light in all its guises. Recently however, I have returned to oil painting, having worked in watercolour for so long it has been interesting to paint similar subjects in both mediums. Whatever the subject my approach in both watercolour and oils is to work for as long as I can as loose as I can, only to add the 'structure' towards the end of the painting to , hopefully, pull everything together without tightening up and overworking the painting. Many of the paintings seen here are close to my home in South Devon. However having the opportunity to demonstrate or run workshops to art groups all over the country has given me the chance to sketch and paint in other inspiring locations countrywide. 'Cows at Flatford' is a case in point. 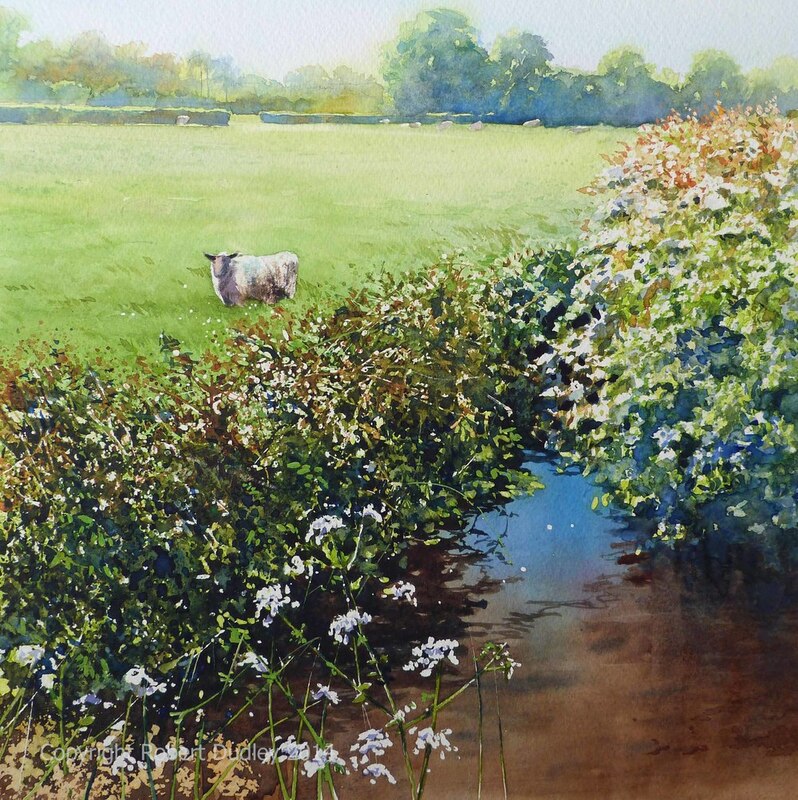 When tutoring at Flatford Mill at then end of one session I was able to walk to the water meadows, take some photographs and make some sketches that later, back in the studio, I was able to turn into the watercolour on the left. A very different landscape compared to the hills and rivers of Devon but nonetheless inspiring. Whilst sketching on the Somerset Levels recently a rather inquisitive sheep left the flock and wandered over to the edge of the field and while I sketched, so it stayed. The moment I closed my sketchbook it rejoined the flock. Needless to say it became the star of the painting.